Have you ever faced the situation when you strongly needed any tool to help you quickly fix or repair something indoor or outdoor? Most of us are facing this situation almost every day. With the Grand Way Multitool you will always be prepared and have right tool in hand. The only multi-function tool you will ever need. This Grand Way 24 in 1 functional multitool is the perfect solution for your everyday DIY requirements. It is constructed from high quality, durable stainless steel and is ultra reliable and robust. It is also useful as a car multitool and will not take a lot of space. It is quick-deploying and is always ready to help you in emergency situations like cutting seat belts after an accident. Our multifunction tool is versatile and will help you with simple home and office repairs, like tightening the screws on your eyeglasses. It also quickly folds up to fit your pocket when you don't need it. Our tool has a heavy-duty construction and is pleasant to the touch. ONE OF THE FEW MULTI TOOLS WITH ATTACHABLE BITS. This is what turns a tool into a TRUE multi tool. So many others look good until you actually have to use them. Then many of the tools won't fit or are wrong for the job. It's so much better to have Attachable Bit capability like this multi tool. 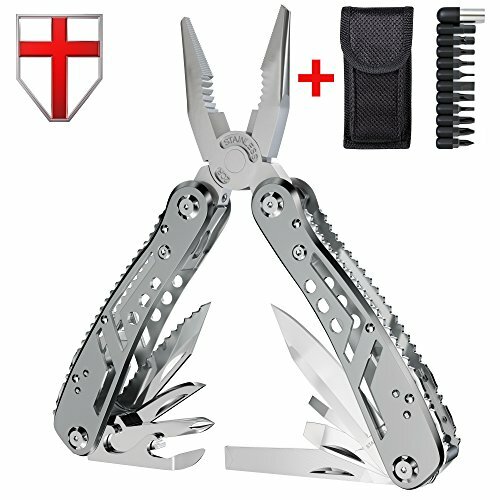 It is a modern multifunction tool with unique skeleton design handles which significantly decrease the weight of this utility tool. Now you can work on just about anything with the 11 included bits. Compact and portable, the GrandWay universal tool is the ultimate survival tool for long car trips, traveling construction work, or outdoor adventures like camping, hunting, hiking, and fishing. MINI TOOL WITH 24 FEATURES - pliers, wire cutter and stripper, folding main blade kitchen knife, can and bottle opener, metal file, screwdrivers, 11 attachable bits with magnetic connector, scraper and awl. It is a true multifunction utility tool. COMPACT MULTIFUNCTIONAL TOOL FOR ANY PURPOSE - Camping, Hiking, Backpack, Hunting & Fishing, Military & Army needs, Outdoor & DIY Activities, Survival, Self Defense, Emergencies by carrying in a pocket, pouch or tool box. It is also easy to use as a car or bike repair tool and saves much space. 420 STAINLESS STEEL - excellent balance of hardness and corrosion resistance ensures proper operation without sharpening. Provides razor sharp cutting performance and high durability. 100% MONEY BACK GUARANTEE - your new all-in-one tool is protected by Grand Way 10-year warranty. A perfect gift for men or women in your life.